Salvaging' is a Tradeskill Prestige Ability introduced with Chains of Eternity. It's part of the "Refining" ability set. Once you are Tradeskill level 90 you will start acquiring a Tradeskill Prestige point every 20% of a level. Press "L" to open your Character Development Window. Then Press the "Tradeskill Prestige" button on the left. Develop the left-hand column to earn Refining abilities. Salvaging is the choice in the third row, and requires 3 points spent in one of the two abilities just above it. Salvaging lets you salvage items into raw materials. It works like Transmuting. 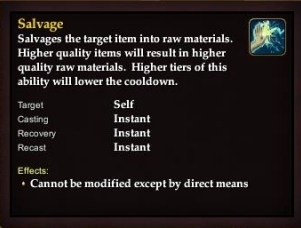 When you've earned the Salvaging Ability you select it, then select an item to Salvage. No-Trade items cannot be salvaged. ZAM credits this article at EQ2 Traders Corner for Cooldown details and results. This page last modified 2012-11-11 15:02:35.